That Martian robot has gained sentience, and is looking at us. It can see itself, and it knows we can see it. Forget the cute, cuddly and anthropomorphic mastcam self-portrait, it is now showing its true nature - a monstrous space-robot bristling with cameras and scientific instrumentation. In other words, MSL Curiosity's MAHLI camera is fully activated, the lens cover is open and it's busy inspecting itself. 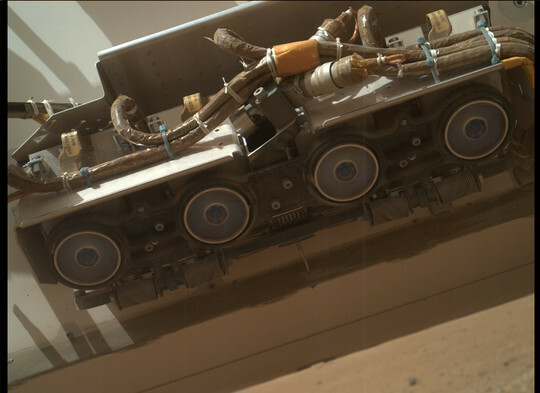 Calibration targets, wheels, hazcams - this is rather fancy. SPAAAACE! Ahem.